Ha Long is the popular travel destination in Quang Ninh province Vietnam. It is not only naturally endowed with spectacular landscapes but also various types of cuisine. When visiting Ha Long, tourists have chances to taste the most special seafoods as well as Vietnamese traditional foods. We hope this list can help tourists find wonderful experiences in Ha Long. Halong City is famous for many specialities as well as various kinds of fresh squid. Although Squids in Ha Long are not as big as those in Nha Trang, Phan Thiet, they are thickest and best meat. Fresh Sim Squids are usually used to stir or fry, Cuttle Squids are especially used to make Squid Sausage. Making Squid Sausage requires the housewives professional experiences and dexterity, from the very first process like choosing squids, “doing surgery” in the organs of squids to the last processes like pounding, tasting and frying. According to the housswives in this region, the tasty squid sausage depends on 90% of the squid’s quality. The hot finished squid sausage that is eatened with rolled sticky rice or boiled rice is impossibly decried. The taste is simple but makes local people and tourists bear in mind long- lasting time. Nowadays, squid sausage is more industrially produced than years ago, wrapped and vacuumed, which is easier for bringing along. The taste is a little reduced, but Halong squid sausage is still the best. Banh gat gu looks like Pho or Rolled Pho in Hanoi, which is the famous dishes in Tien Yen, Quang Ninh. Some local residents explain the name of this food is when you pick up a piece of food, it will vibrate up and down like a nodding head. But others said that the food is really tasty, so diners have to nodded continuously to encourage the makers. 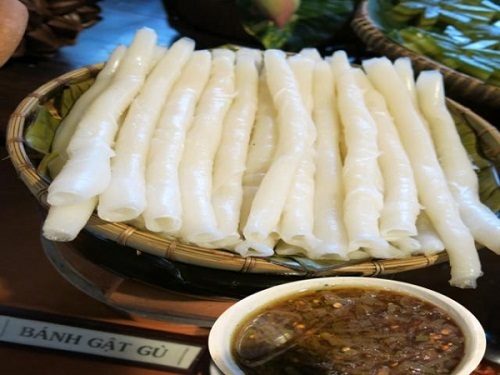 Banh gat gu is the mixture of steaming rice flour that looks like rolls and noodles. The process of making cake is so complex: Rice is soaked from the night before, until the next morning, it is freshly crushed into powdered water. During powdering flour, people ordinarily add cool rice the make the cake puffy, spongy, smooth plastic that the same types of cake is impossibly comparable. 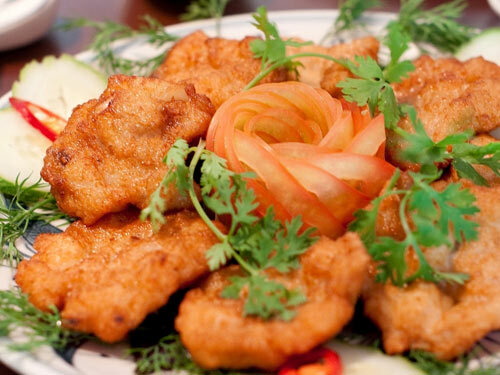 It is usually eaten with special sauce and caramelized pork or dog meat. The sauce is the most outstanding point of this dish. Tourists can feel the soft cake and juicy pork, which must be an impressive culinary experience. Sipunuculas nudus (also called seaweed) usually lives in deep caves, under the sand, colors reddish brown, 10-15cm long with tiny strands on its body. It is shaped like a earthworm, but larger in size and its intestine contains full of sands. Processing sipunculus nudus is very complex and elaborate: operating along its body, flipping it out to rub thoroughly with salt to get rid of sands in the intestines fishy smell then it must be washed under the strong tab water several times until its color turns into ivory white. Sipunculus nudus is the healthy food that is rich of protein and other nutrients. 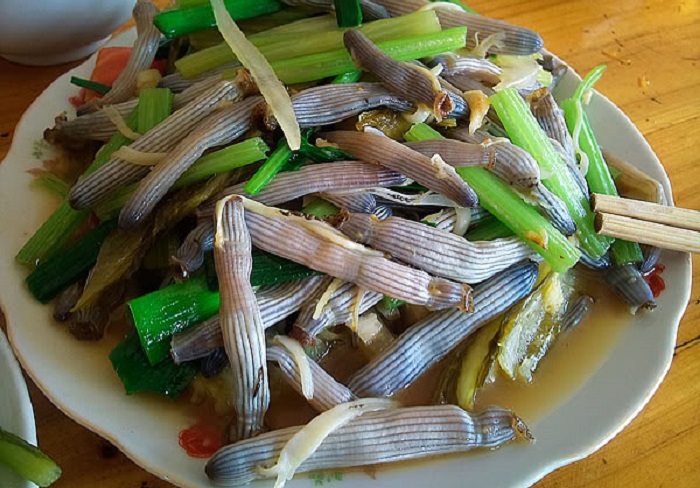 The local people usually cook the Sipunculus nudus into: Sweet and sour Sipunculus nudus, Sipunculus nudus fried with garlic and especially the crunchy fried sipunculus nudus. It’s so interesting that tourists can enjoy the fried sipunculus nudus while admiring the beach landscape in the afternoon.